Fido’s Day Off – The Best Things to Do With Your Dog in St. Louis! The time of year that dogs get antsy for has finally come – they just can’t wait to feel the sunshine on their snout and the green grass on their paws! It may be difficult to find outlets for your pup’s natural energy, but St. Louis is chock-full of fantastic activities for you and your dog to do together. Check out what you and your pup can do below! Whether you are from St. Louis and want to take a “stay-cation” or visiting from another area, you can always take advantage of the long list of hotels that are pet-friendly. There are several affordable options for you and your furry friend to stay in downtown or the surrounding area! Finding a place to stay is just the first step to a fun weekend. Now it’s time to check out all the fun activities that St. Louis offers for you and your cuddly buddy all spring and summer long. Dog-themed events happen frequently throughout the year, but what can you do on a day when no event is? Here are two activities to check out! Catch the Pro Plan Performance Team at one of their three shows a day! This team of athlete dogs is made up of entirely rescue dogs, and you can watch them jump, catch discs, and complete the complex agility course. You can also download the Purina Pro Plan P5 app for your phone; it offers step-by-step instructions and videos that will help anyone teach their dog something new! To make a reservation for a day of fun with your furry friend, call 314- 982-3232. This unique museum is dedicated to and allows admission to dogs! It displays over 700 original paintings, drawings, sculptures, and much more depicting man’s best friend throughout the ages. While you enjoy the art culture, your dog is offered treats and fresh water. Every Saturday and Sunday from March to October, the museum offers Guest Dog of the Week, which is a fun way for you and your pup to meet other dogs and ask the owner questions about the breed and temperament of their dogs. The Museum of the Dog is open Tuesday-Saturday from 10 a.m. to 4 p.m. and Sunday from 1 to 5 p.m. Price of admission is only $5 for adults, $2.50 for seniors, and $1 for children. Call 314-821-3647 for more information. St. Louis has several restaurants that offer patios for dogs and their humans to relax and enjoy some delicious food. Last time, we compiled a big list of all the great places you can take your pup to if you want some tasty food. Your dog will love sitting at your feet and people-watching while you savor some great hometown favorite foods. In most parks, dogs are welcomed but are restricted to their leash, and they can’t fully enjoy their day outdoors. 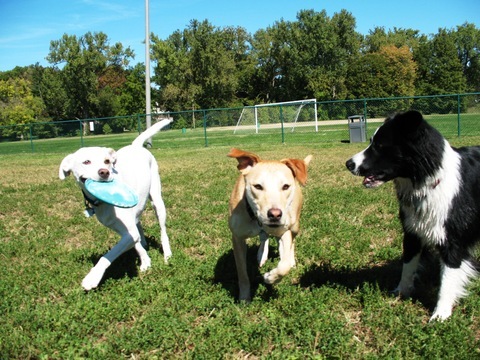 Below is a list of dog parks in the St. Louis area that offer a fun, leash-free environment. Lister Dog Park– Lister Park is fenced in and offers mulch ground instead of dirt to help reduce muddy paws. John and Lucille Wendling Soulard Dog Park – This park is fenced and separated into four sections totaling in 1.5 acres of land for your dog to run around on. Featuring water and waste receptacles, this park is also located in a dog-friendly neighborhood! Treecourt Swimming Pool –Lounging in the pool should not be restricted to humans! Take your pooch for a fun day in the water at the Treecourt Swimming Pool. All dogs are temperament-tested before being issued a membership. Admission is $30 per month or $300 per year for an unlimited pass for you and your furry friend. Not only is there a pool, but there is also a large fenced in park for your dog to run around in and enjoy. That’s the best of both worlds in our book! This entry was posted in Fun information and tagged BauserHaus, Dog Museum STL, dog parks STL, doggy daycare STL, fun with dog in STL, St Louis Forest Park. Bookmark the permalink.